I am starting to have more work-in-progresses than I have actual finished pieces!! Today a friend and I decided to start a crochet-along to celebrate the end of our current courses. So we have decided to have a go at the Happypotamus design by Heidi Bears. I am using Stylecraft yarn: plum, meadow and fiesta; James Brett baby vanilla. I am using a 3mm hook. It is a mixture of different shaped african flowers....it is amazing what she has produced......so imaginative. Today we managed to do 6 shapes...only another 38 to go; it should keep us out of mischief for awhile. Although we live 100 miles apart, we can still have a good laugh via facebook messenger and send pics of how we're getting on, or showing how to do something if we're a little confused. Unfortunately it does prove how difficult it is to count to 7 as we're not fully concentrating on what we're doing and so there has been a fair bit of frogging going on. All part of the fun though. A friend has come up with a very good suggestion, so I shall be playing around with that soon and see how it looks before I say what it is. It's a lovely pattern and I admired it some months ago but it was far too advanced for me and I was rather scared by it. However, the only new stitch was a long treble crochet, which now I am more confident, didn't phase me at all! It is really amazing how fast you progress with crochet. Seems a little bare without the long treble stitches. Another terribly non-productive day......well when the weather is behaving, it is a good idea to do some gardening. Today I did a couple more pentagons and an octagon. I can't wait to see this in its final form. I'm thinking of turning it into a doorstop for the lounge....the colours will go perfectly there. After so long all the motifs were made....they were overflowing out of my little tin. Now came the tricky bit......assembly time. It was a bit of a challenge. I decided to sew mine together as I couldn't get to grips with Heidi's 'join as you go' method, however, I think it probably is worth persevering and mastering it (I shall do this next time). Yes, even though I was starting to get bored with making all the motifs, there will be a next time. I'm not going to say exactly how he was put together as you can see for yourself by clicking on the 'happypotamus' link above. As I had decided to make him into a doorstop, before I filled the body with toy stuffing (and boy did he eat some stuffing - well I don't suppose they get to that size on nothing), I filled some sandwich bags with about 2 tablespoons of play sand and tied the tops securely. I put a bit of stuffing in and then the sandbags and then more stuffing around them so that you couldn't feel the bags and then continued to fill his body. Drum roll.............and now I would like to introduce you to CLAUDIUS! Wanted to write a quick thank you for putting a tail on Happypotamus. 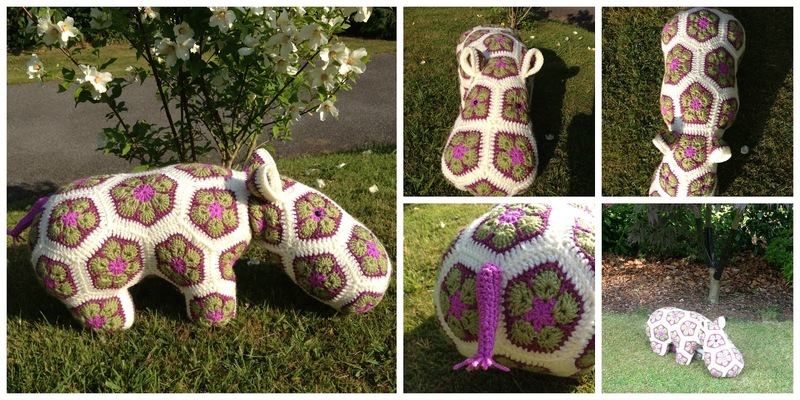 We are sad to find that there is no tail on this project, and found your addition after searching hippo bottoms. lol thanks again. He is very handsome and the colors are beautiful. Is there any way you could post the instructions for the heptagon? So this is not all hexagons like I thought it was?? Well okay then, who knew?! Well off to get started! Wish me luck.